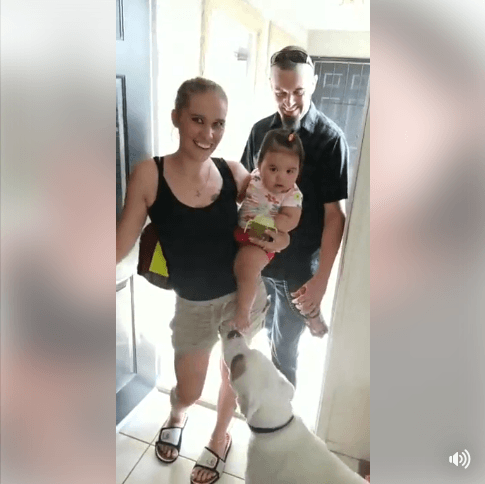 Tabitha and Jeff Shoars are celebrating that their youngest child, 10 month old Nytallieya, is back home after being seized by Nevada Child Protective Services just after noon on Monday, June 5, 2017. The baby was taken from their Las Vegas home after Arizona Department of Child Safety social workers sent a report to Nevada CPS alleging that the Shoars left the child with an "unsafe caregiver." The Shoars disputed that claim, saying that the caregiver to whom Arizona DCS refers is someone that they feel quite confident about - a retired police officer and his wife. The judge ruled that there "was no impending danger to remove the child." He noted that Nevada CPS has been in the Shoars' home on previous occasions, and found no cause to remove the child, who was born in Nevada. He stated: "There is not a factual statement within the report to warrant removal of the child." You said it Bob, It's all about the money, I truly belief that the Judges , Lawyers, so called workers are all in it for the money, I also belief that the judges and lawyers are on the pay roll of CPS. With NO accountability to no one CPS and the people that support them will continue to kidnap our children, screaming, "In the best interest of the child" Makes the mind wobble!!! Arizona Judges attend "classes" that are designed to support CPS/DCS in the taking of 10's of thousands of children from their families in Arizona. The un-disclosed objective seems to be keeping lawyers employed and earning fees that destroy the families and their relatives's assets, because parents are willing to spend everything they can get, and borrow from everyone they know just to have their children returned -- all on the broken promises from "officers of the court" of "reunification" that is contingent upon the parents jumping through hoops that are impossible to achieve. These atrocities have continued for years. When I first became aware of the many problems, (a year when 12 children were killed in the hands of CPS Workers that went un-investigated), I, along with several others attempted to have the Legislature "sunset" CPS... The Legislature gave CPS 2 years to perform a forensic audit. CPS did not do so, and the Legislature gave CPS a "PASS" allowing the atrocities to continue. Governor Brewer abolished CPS in her State of the State address and asked the Legislature to pass funding for DCS as she left office... CPS no longer exists. Their offices were filled with the same people, without purging the problems and crimes being committed by the evil workers... I am sure there are a few dedicated persons working there; however, the others give the State a bad name. Until severe sanctions are taken against workers who are committing atrocities against children - - the abuse by DCS, Judges and Lawyers will continue to plague Arizona. There is no justice for the children... It is simply a financial source of income for the state to fund other projects. No one has accounted for the missing children that have been taken and have now "disappeared" and instead of justice it is "JUST-US" (JUDGES AND LAWYERS)... Follow the money.... Billions, if not Trillions. If you were an Arab, what would you pay for a little blond-haired, blue-eyed baby girl? Arizona Judges attend "classes" that are designed to support CPS/DCS in the taking of 10's of thousands of children from their families in Arizona. The un-disclosed objective seems to be keeping lawyers employed and earning fees that destroy the families and their relatives's assets, because parents are willing to spend everything they can get, and borrow from everyone they know just to have their children returned -- all on the broken promises from "officers of the court" of "reunification" that is contingent upon the parents jumping through hoops that are impossible to achieve These atrocities have continued for years. When I first became aware of the many problems, (a year when 12 children were killed in the hands of CPS Workers that went un-investigated), I, along with several others attempted to have the Legislature "sunset" CPS... The Legislature gave CPS 2 years to perform a forensic audit. CPS did not do so, and the Legislature gave CPS a "PASS" allowing the atrocities to continue. Governor Brewer abolished CPS in her State of the State address and asked the Legislature to pass funding for DCS as she left office... CPS no longer exists. Their offices were filled with the same people, without purging the problems and crimes being committed by the evil workers... I am sure there are a few dedicated persons working there; however, the others give the State a bad name. Until severe sanctions are taken against workers who are committing atrocities against children - - the abuse by DCS, Judges and Lawyers will continue to plague Arizona. There is no justice for the children... It is simply a financial source of income for the state to fund other projects. No one has accounted for the missing children that have been taken and have now "dissappeared"
One thing I don't get is, I always heard that republicans were pro-family and wanted less government and more individual autonomy. Yet the repub state Arizona is the worst in the nation for child takings. Where is the small government and individual autonomy in all that? Hey this great but bittersweet at the same time. They lost a child forever, a pain I know, they lost their now ten month old for a time, and Arizona is trying to take the rest of them. Arizona: you need to fix the problem you have in your child welfare structure. It is infecting the effort of the few that are there for the right reasons. You need to send ALL of these children home so these parents, who have been through SO MUCH more than you will EVER know, can have a true reunion. I pray it happens, though I fear it won't. Be the miracle, whoever in your ranks can make it happen a judge, a governor, a supervisor, a director..whoever! Thank you to Medical Kidnap for keeping us tuned in. To this family : God bless you all! I'm so sorry for what you have been through and what u are going through still. You are not alone. Give God the glory for what u got back ! Love that Baby. I know you do.